3 Bedroom Semi Detached House For Sale in Chesterfield for £199,950. Now Offered With Fully Integrated Kitchen Including A Dryer And Price To Include Carpets In Certain Rooms. Small Exclusive Development Of Only 6 New Build Semi Detached Properties. 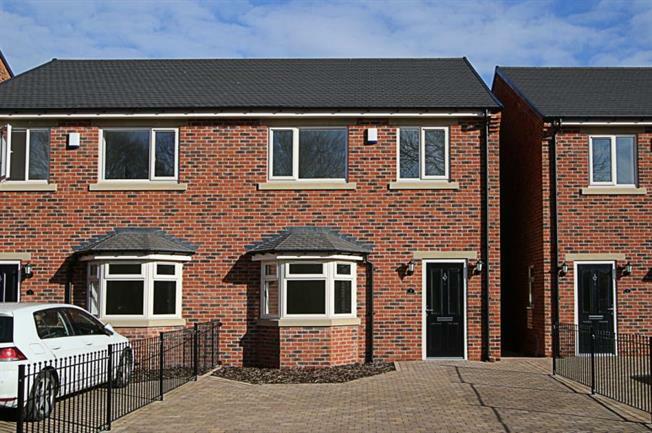 Offered for sale with Federation of Master Builders guarantees are these deceptively spacious three bedroom NEW BUILD semi detached family homes situated in this pleasant and exclusive tree lined cul-de-sac location. This private development of just 6 family homes is set back from Rectory Road backing onto the conservation area and has the benefit of off road parking & enclosed rear gardens. The accommodation in brief comprises: entrance hallway, ground floor cloakroom/WC comprising contemporary two piece suite in white, Front facing living room, rear facing dining kitchen with French style doors to rear enclosed garden, first floor landing, master bedroom with contemporary en suite shower room with tiling to splash backs & floor, two further bedrooms & family bathroom fitted with a contemporary four piece suite in white comprising: wash hand basin, low flush wc, bath & separate shower enclosure having mains shower within, also having tiling to splash backs & floor. Externally: a driveway provides off road parking leading to an attractive mainly laid to lawn garden with flagged patio area.